Julian Martinez Pocano, known as Coming of the Spirits, had no formal art training. He is best known for his designs he painted on pottery that his wife, Maria, shaped. He also painted gouache on paper paintings since 1920. 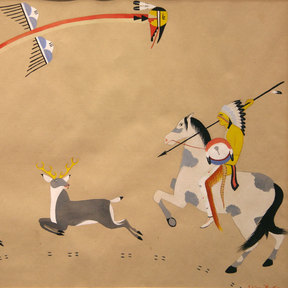 He received several commissions for murals, which are shown at the School of American Research in Santa Fe, the Santa Fe Indian School, and the Mesa Verde National Park in Colorado.